Coconut flour cookies – gluten-free, dairy-free, grain-free, refined sugar-free, and egg-free. 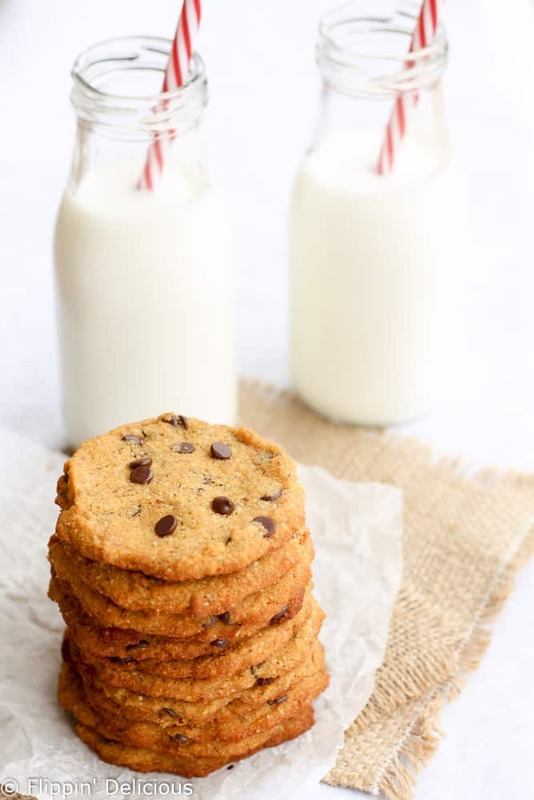 Super chewy and studded with chocolate chips, they go perfect with a glass of milk. Just 8 ingredients! Chocolate chip cookies really are a classic. There is no arguing about that, it is a fact. Everyone should be able to indulge in a chocolate chip cookie every once in a while. Even if they have different dietary restrictions. That is why I made these coconut flour cookies. They are gluten-free, grain-free, refined sugar-free, dairy-free, and egg-free. They are also really chewy and studded with chocolate chips. Though I am the resident gluten-free dinner fanatic at Food Fanatic, I really am a cookie fanatic too. When I was 8 years old my sister (who was 6) and I sold chocolate chip cookies in our neighborhood and earned money to buy ourselves bikes. We baked hundreds of dozens of cookies, and that isn’t even the start of my love affair with cookies. Cookies are one of the first things I remember baking with my mom. She isn’t much of a baker, but my sisters and I loved making cookies with her when we were little. Fast forward however many years and now I’m the biggest cookie fanatic EVAH! After I quit eating wheat and gluten, I had to rework a lot of my favorite recipes. Recreate them to get the cookies that I remembered. Well, I went past that a little bit and I made them better than I remembered them. You know those soft frosted sugar cookies in the bakery section of the grocery store? The cakey ones with that thick layer of frosting and sprinkles? I mastered the gluten free soft frosted sugar cookie, even making a dairy-free version. After that I moved on to mastering many other cookies, and writing an entire cookbook filled with gluten-free cookies. In less than 3 months I made (and ate) more than 50 different kinds of cookies. Anyways… back to the chocolate chip cookies. Everyone should be able to eat a chocolate chip cookie every once in awhile, no matter what their dietary restrictions. And that cookie shouldn’t taste like cardboard. If you are a fan of oatmeal cookies, like I am, then I think you’ll love my friend Texanerin’s Gluten Free Oatmeal Cookies. They aren’t grain-free but can be made refined sugar-free with coconut sugar. They do have coconut flour (of course) and a little bit of almond flour too. Coconut flour needs a lot of moisture, so I used honey to sweeten these cookies. The coconut flour just soaks up all the moisture. The dough will be a bit more “batter-y” than traditional cookie dough. That comes from the honey and coconut oil. As the dough sits for a few minutes before you scoop it – it will get a bit thicker. These cookies also don’t spread as much when they bake, so you have to help them out a bit and pat the cookies out just a before you bake them. If you have a scale, use the weight measurements for best results. The results and sweet, chewy, and very satisfying. Especially with a glass of your favorite milk. These cookies aren’t low carb because of the honey, If you are looking for a low carb cookie, I think you’ll love this Low Carb Keto Cream Cheese Cookies Recipe. 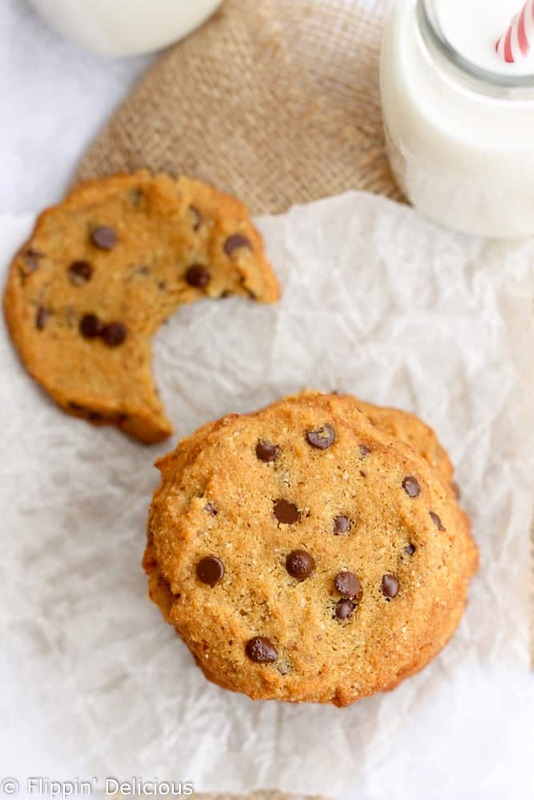 If you are searching for more grain-free cookie recipes you might like my friend Taylor from Food, Faith, Fitness’ Peanut Butter Chickpea Chocolate Chip Cookies. I know you are thinking “chickpeas in cookies?! ?” but don’t knock it ’til you try it. Egg-free and coconut flour 😀 Just made my day! Haha, Thanks Rebecca! Your pumpkin spice chickpeas made my day, so now we are even I guess. Hi Do you know a good substitution for the almond flour? My children have allergies to nuts, eggs and dairy. It’s very hard to find recipes that actually turn out minus eggs, nuts and dairy. Hi Amanda! I haven’t personally made these cookies without the almond flour, but I had several people comment and say that they used ground oats and they turned out great. Check the comments, they gave the amounts they substituted. 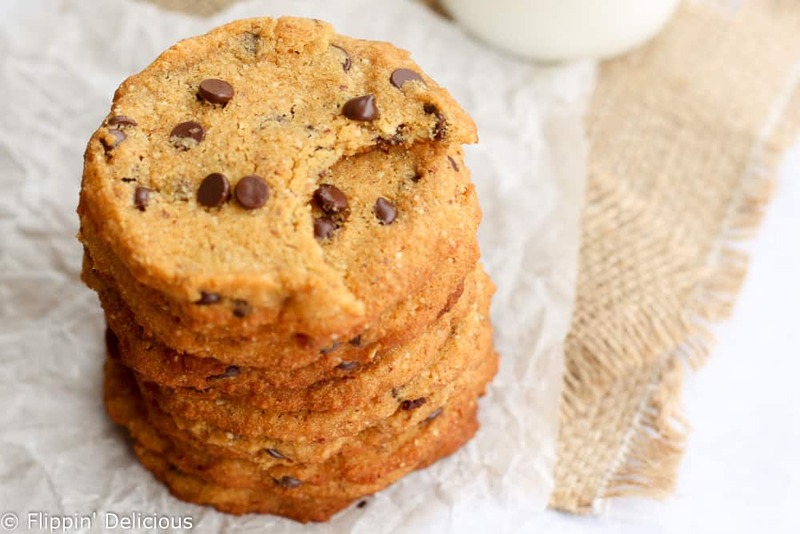 A nice simple grain free, paleo friendly, chocolate chip cookie recipe. Perfect! Thanks Laureen! They were quite a hit, disappeared like hot-cakes. I LOVE baking with coconut flour, by far my favorite flour! These looks delish and so simple and easy to make! I must try! Thanks Bethany! I haven’t dabbled much with coconut flour yet, but it is quite an adventure. Hi do you know the calories and net carbs?? No, I do not. If you need to calculate the nutrition facts I suggest entering the ingredients you use in a nutrition facts calculator. I have used my fitness pal in the past. 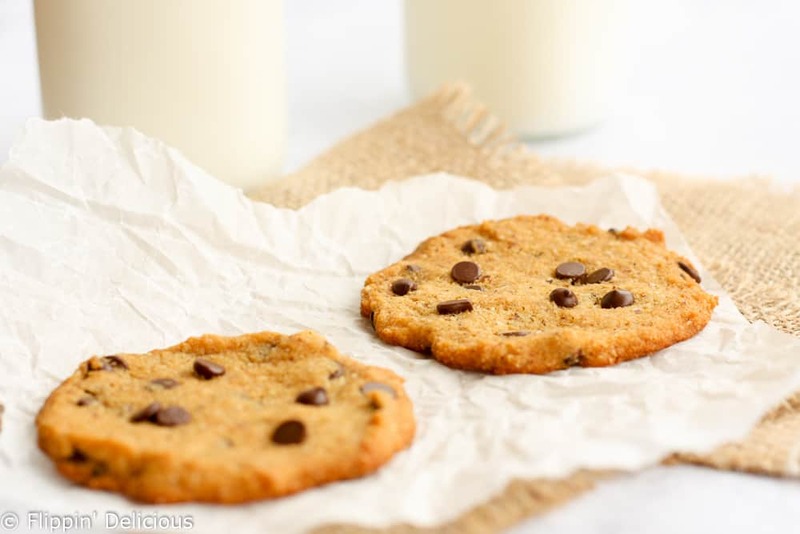 Love that they are so allergy friendly, nothing beats a good chocolate chip cookie! Thanks Sylvie! So true, chocolate chip cookies are the best. these look so amazing, I am a sucker for chocolate chip cookies! Thanks Tessa! I am a huge fan of chocolate chip cookies, or just about anything with chocolate. Hi Brianna, I have avoided using coconut flour in the past because most of the recipes use eggs for moisture or the finished product is grainy or crumbly. I will try these. Is there a particular coconut flour brand that you can recommend? Thank you. I’ve used Trader Joe’s coconut flour, and another coconut flour that I don’t remember the brand of (it was one my mom had on hand when we were visiting.) I’m sorry I don’t have a better suggestion for which brands are good. 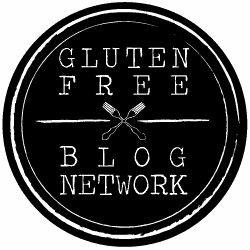 I think Danielle from Against All Grain was working on a post about coconut flour. She references it HERE, but I couldn’t find her finished post, I don’t think it is up yet. Thank you. I have prepared this recipes twice. On both occasions I have used the Trader Joe’s Coconut flour. Both times I did not have mini chocolate chips – I used 1/4 cup of chopped average-sized bittersweet chocolate chips. The first time, I prepared them as indicated. YUM!!! The next time, my sister came to visit, so I added a pinch of ground cayenne and ground cinnamon because she prefers spicy and hot chocolate-based treats. She was delighted!!! They were chewy and delicious. Once again, thank you. Yay! I’m so happy that you’ve enjoyed them Virginia! The cayenne and cinnamon sounds like a great addition! I don’t often add spice to cookies like that, but it is a genius idea. I LOVE Mexican hot chocolate. I’ll have to try the spice next time I make them. It makes me so happy when people come back and comment. It helps me to see how my recipes actually help people, which makes my day! Thank you! Thanks Vanessa! I hope that you and your family really enjoy them. These look amazing! They are actually making me eat cookies right now! Haha. I love it Elle! What can I substitute for the almond flour? I know this is free of so many allergens, but we are nut-free as well. I am sorry, but I don’t know of anything that would substitute for the almond flour straight across. You could try a little rice flour? or use more coconut flour? You’ll have to play around with it a bit to make it nut-free, sorry! I wasn’t able to get the cookie to have the texture that I wanted it to have without a little almond flour. I use quinoa flour in place of almond flour and they turned out great! I am sorry that your cookies didn’t turn out as you hoped! The amount of cookies that the recipe makes will vary if your scoops of dough were different sized than mine. Despite all best efforts, sometimes you’ll get more or less cookies with a recipe. I love using measured spring-loaded cookie scoops (like ice cream scoops but smaller) because they give much more consistent results. It is also possible that your oven temperature is off, or you have a hot spot. I have an oven thermometer, which I love! I always know exactly what temperature my oven is and it helps to prevent baking fails. It is also a good idea to rotate your pans halfway through baking in case you have hot spots. I hope that helps a little bit. Happy Baking! Thanks for replying! These were great by the way, even burnt! Definitely going to make them again! Any chance to get the nutritional break down for these? I don’t do a nutritional breakdown for my recipes, but I know that there are lots of sites that will give you the nutrition info if you enter the ingredients. I have used my fitness pal before, but I know there are a lot of websites that will calculate it for you. Google “nutrition info calculator” or something like that and I am sure you will find a tool that is easy for you to use. Approximately 60 calories per cookies. This is based on a dozen cookies. Good to know, thanks Alana! Just made these and they are delicious! I subbed honey for maple syrup since that is what I had on hand. I found that the recipe only made 12 cookies, even though they were very small. Still, they are amazing! I will definitely be making these again (and doubling the recipe so they don’t get eaten so quickly!) Thanks for this great recipe! I haven’t tried anything else, Lisa. But I would think you could substitute another nut-flour or nut-meal and get similar results. Hope that helps! I LOVE cassava flour! If you try it, let me know. I have only ever used cassava for tortillas… because they are amazing and there is none left for baking anything else. Thanks for stopping by Melanie! I hope you and your kids enjoy the cookies. The recipe looks great, and I’m looking forward to trying more of your recipes! My question is, is the coconut oil melted or solid. If I recall correctly, mine was melted. It was July so the temp was above 70 and the coconut oil was liquid. Melted or softened coconut oil will work just fine. Because you mix it with the honey I don’t think it will make a difference whether or not it is melted as long as it is soft enough to mix smoothly with the honey. Hope that helps. Happy Baking! I haven’t tried it, but it is possible someone else has. I don’t have a lot of experience with agave, but in my memory it is runnier than honey so maybe use a little less? If you try it, be sure to comment back so everyone else will know if it worked or not. how many calories in one of these ? out in order for the cookies to form solid. I used Bob’s red mill coconut flour, and let it sit for 10+ minutes. The only changes I made were doubling the batch (even let dough sit for longer so it would absorb) and melting coconut oil in the oven to make a liquid. Delish, but any suggestions to make the process be easier/speedier? Maybe I need to use an electric mixer, or was the double batch maybe messing it up? Hi! I am so happy that you have been enjoying this recipe! It is hard to know exactly where the excess liquid is coming from without being in the kitchen with you. I have heard that some coconut flours absorb differently than others (if I remember correctly I was using Trader Joe’s coconut flour?) . If that is the case, and your coconut flour doesn’t absorb as much as mine did you might just need a little less oil. Doubling the batch could have something to do with it too, like you thought. Doubling it would mean there would be twice as much excess oil, if the absorption is different with your coconut flour. When I made them I was using an electric mixer, which helps to emulsify the batter. That might have been part of the reason why there was liquid that would separate out. Just what I am looking for! Question: Have you ever frozen this dough to bake later? Or, any dough with coconut flour or GF flour (like your *famous* sugar cookies)? We are hosting a celebration and I need to bake ahead of time. I prefer to make the dough a week ahead of time, then bake a day or two before. I haven’t ever frozen this coconut flour cookie dough to bake later, but I have frozen my sugar cookie dough. I have also frozen baked and frosted sugar cookies for several weeks (they never last longer than that!) They are perfectly fresh and soft once they defrost. My favorite cookie dought to freeze if my gluten free giant chocolate chip cookies. I will make normal sized cookies out of them too. Just scoop the dough, and freeze. Then bake according to the directions straight from the freezer. They may take a few extra minutes, but they always turn out perfect for me. These sound delish! I’m new to dietary allergies/restrictions so appreciate the great recipe. We are unable to consume nuts – would these work with ONLY coconut flour or do you think I could sub rice flour? Thanks! Hi Jaclyn! I do not know of anything that would substitute 1 to 1 for the almond flour. You’ll have to experiment! Let me know if you find a sub that works out. You could sub ground sunflower seeds in place of almonds. I have done that successfully in other recipes. I plan to try this recipe with that sub as I too am nut free, dairy free, gluten free, and egg free. Hi Tracy! Yes I do. I send out new recipes on a weekly(ish) basis and you can sign up HERE. What can I substitute for almond flour & in what quantity? 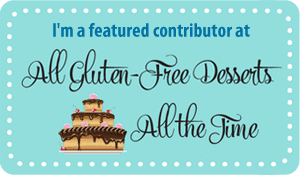 I’m new to the gluten + grain free world, so I’m still learning. Most everything has almond flour in it, but I have an almond allergy, so there’s got to be a substitute that works for this cookie!! Hi Lorilynn! I haven’t tried any substitutions for the almond flour but another reader subbed freshly ground gluten free quick oats (pulsed in a blender until flour like consistency.) She said they turned out fabulous! Hope that helps. Looks delicious!! Is there any alternative to using almond flour? I’d love to make these for vacation tomorrow but I can’t eat almonds. I’m DF, SF and WF for my baby. Hi Steph! I haven’t tried any substitutions but another reader subbed freshly ground gluten free quick oats (pulsed in a blender until flour like consistency.) She said they turned out fabulous! Sorry I didn’t respond in time for vacation. You can always email me (flippindelicious(at)gmail(dot)com) if you have any more questions. With the busy summer and kids home from school I haven’t been able to moderate comments as often. But email I check a minimum of 2x a day during the week. I have a nut allergy but am able to eat coconut. I subbed in freshly ground gluten free quick oats made into flour for the almond flour. Thanks so much Anita! I am so happy that you found a substitute that worked so well. Thank you for sharing it with everyone. I am wondering if I can subtitute the almond flour with another Gluten free one, rice or chick pea or other? I am allergic to almonds. Other than that these ch. chip cookies look really great. Thanks for the recipe! I haven’t tried another flour, but I know that a reader used freshly ground GF oats and had good results. She left a comment a few months ago so you can see what she did. Let me know what you try! Happy Baking! I made these cookies today and they are amazing! Nicely sweet without having that feeling of a sugar hangover! I used chickpea flour in place of the almond flour and they turned out perfect. I like using chickpea flour in baking because I find it yields a nice chewy texture that’s perfect for cookies. I also used maple syrup because…well…I love it! I’m Canadian, it’s in my blood! It is a great idea to sub chickpea flour for the almond flour. I’ll have to try it! Plus maple syrup is a genius sub! I love maple syrup, I’ll have to try it next time. So happy that you loved these cookies! Can I omit the honey? You are not able to omit the honey without making some other substitutions. You could try using maple syrup or agave, but they have different consistencies so you wouldn’t be able to substitute them straight across. If you try substituting another sweetener come back and comment so that I (and other readers) know what worked or didn’t work for you. I had high hopes for these, but they are just crumbles of piles. I did follow the recipe exactly, but this one was a fail for me. I don’t think I’ve had any luck with coconut flour at all, but I’ll keep trying! Hi Lynne, I am sorry they didn’t turn out for you! Coconut flour can be very fickle and absorption rates vary by brand. The weather has also made recipes using coconut flour turn funky on me. For that reason I only have a few recipes that I use coconut flour in. It is a difficult flour to use! I’m not sure what I’m doing wrong but the dough has been sitting for 15 minutes and it still has a ton of liquid. Any thoughts? My best guess is that it is the coconut flour. It is a very fickle flour and many different brands absorb liquid differently. I would try adding a little bit more coconut flour until you have a scoopable dough. Just be careful because if you add too much it will make your cookies dry. Hi, I just made two batches of these and they are delicious :)) I turned my oven down because the sides burnt on my first batch. The second batch is chewy and sweet and as good as any ‘normal’ cookie hurrah!! YAY! I am so happy that you are enjoying this recipe Felicity! All ovens bake so differently, I always have a thermometer in my oven now to monitor the temperature. I am glad that they baked perfectly the second time around. Love this recipe! I used some orange oil to give it a slightly different flavor! Also, for convection baking, it only takes between 7-8 minutes for the larger cookies! This recipe is great! Both of our kids have multiple food allergies and there aren’t many things I’ve made for non allergic family that they haven’t wished were made with ‘regular’ ingredients but these have been a hit every time. The first time I made these it was a catastrophe because I subbed out the chocolate chips with cacao because I could not find vegan chocolate chips (huge mistake) nor did I have vanilla extract. The second time I had ALL the required ingredients. I used regular sized chocolate chips, not the minis. I wasn’t sure if I was suppose to melt the coconut oil or not (instructions did not specify) but I didn’t. My cookie dough scoops were nearly a tablespoon and I did not over flatten the dough when placing them on the baking sheet. The results: 11, perfectly soft, chewy, just the right thickness, and sweetness cookies even my non vegan husband loved. I just found this cookie recipe. But the cookies melded together into a giant one while baking. I’m sure I followed the directions completely, including the rest time. It tastes pretty good, but…so do you have any suggestions?? Different brands of coconut flour (and even almond flour) can absorb differently, which could have caused that. When I baked the cookies, they didn’t spread very much at all. Next time I would try adding a little more coconut flour so that the dough doesn’t spread as much, and then I would space the cookies further apart. I thought I’d post about the almond flour because I started to make these and remembered I was out of almond flour. I ground 1/4C Walnuts, in the food processor and used it. Delicious and may even like it better than almond flavoring as it is reminiscent of the way I always made chocolate chip cookies with walnuts. I am going to try that this evening. Just made these and I couldn’t wait to try them! They really hit the spot! These are so delicious and they have just perfect crunch! In exception of one thing…they were too sweet for my taste buds. So next time I make them I will add 1/2 of 1/4 honey but other that these are truly satisfying. Thank you for the recipie. Thanks Claudia, I am happy that you enjoyed them. Technically, once you add the chocolate chips, they are no longer refined sugar free. It depends on the chocolate chips that you use. Can these cookies be made without vanilla? I am allergic to it. Hi Theresa, absolutely! The vanilla is just used as a flavoring. You are welcome to substitute your favorite flavoring, or omit it. You can substitute maple syrup for vanilla. These are in my oven right now, but somehow I only got five cookies from this recipe. I’m a terrible cook though, so it’s definitely something I did. Thanks for sharing GF vegan cookies! So hard to find a recipe that is both. I’ve been experimenting with chia seed eggs but they change the flavor. I’m stoked to try these in a few minutes! I hope that you enjoy them, Heather. Thanks for letting me know you tried them. I see a lot of recipes with coconut oil. Do you melt it first or use it in its hardened state? Hi Dave, it depends on the recipe. For this recipe, you can use coconut oil that is softened or melted. It will not work if the coconut oil is completely firm and solid. Hope that helps. My own batch just came out of the oven and they are amazing! I followed the recipe ratio exactly, but used all coconut flour, and sprinkled some sea salt on top. I personally think they taste better than regular choco chip cookies. Hi Christina, so happy that you were able to enjoy this recipe! This recipe only made 10 tiny cookies?? Guess I need to double or triple next time! Hi Maria, this recipe does make a smaller batch, but I have always gotten more than 10 small cookies. Do you have a substitute for the honey? On a low/no sugar diet. Could liquid Stevia be used? Hi Katrina, There is nothing that I know of that would work for the honey in this recipe. The honey holds the dough together, and anything with a different viscosity wouldn’t work the same way, even maple syrup or agave. Thank you for taking the time to let me know how they turned out. I need to try them with cocoa powder! About how much cocoa did you put in please? Hi! I see that these are refined sugar free (which is great!!). What type of chocolate chip did you use to avoid refined sugar? My go-to is Enjoy Life Foods chocolate chips. They are certified Paleo, but I think they do contain a small amount of sugar. Refined sugar isn’t something I am very wary of, so this isn’t an issue for me. If there is a chocolate chip you prefer, I would love to hear about it. Ok, is there a trick to these that I’m missing? I follow the directions and let them sit but mine are always still pretty runny. Also, I doubled the recipe and barely get 20 cookies out of it. They always bake perfectly and they’re delicious but I was curious if I’m doing something wrong here. I’d love to make larger batches of this somehow. Coconut flour is a bit tricky. I have found many brands absorb flour differently, and coconut flour is also temperamental with the weather. If your batter is a bit runny, try adding another tablespoon or two of coconut or almond flour and letting it sit again (just five minutes or so.) The brands you use probably just absorb liquid differently. How many cookies you make depends on how much batter you use for each cookie. If you use a little more batter than I did, that would be why you got less cookies. Go ahead and double or triple (or quadruple, even) so that you get the number of cookies your heart desires. Can I subtitute honey for sugar? Or anything else? Thank you in advance. This recipe is made with honey, so there is no need to substitute honey for the sugar. There is no sugar in this recipe. What could I substitute honey with (I am on a candida diet – no sugar in any form). I know that without the honey, they will be dryer…correct? Hi Carrie, For this recipe, there isn’t a good substitute for the honey without making many other adjustments and lots of trial and error. Without the honey, the recipe wouldn’t work the same. I’m sorry! Can you please advise how to measure everything in grams? Thank you! I am sorry, I do not have gram measurements for this specific recipe. You may be able to find conversions someplace on the internet. Hi Amy, I didn’t melt the coconut oil and honey, however my coconut oil was in a liquid state. Many different coconut flours absorb liquid differently. If yours is not absorbing the liquid after sitting for 10 minutes try adding another tablespoon or two. I made these tonight and they were to die for! Even the dough prior to baking was out of this world! Oh, I smooshed the dough between 2 large spoons and made sure they were pressed well to the parchment, nice and thin. Then I baked them about 8 minutes as it seems my oven cooks hot. One more thing…. Because they were thin, it made a dozen. My cockies melted into runny pancaky mess. Any suggestions? Followed exactly. I’m sorry, without being in the kitchen with you it is hard to say what happened. Some coconut and almond flours absorb liquids differently, which could cause the issue. It also could be how you measured. This recipe is a little finicky and if you filled your cup with less coconut flour than I did, it would be runny. When measuring, I always spoon the flour into the cup and then level it off with a knife. Hope that helps! Awesome recipe! I used white rice flour instead of Almond as I didn’t have it on hand. Little grainy due to rice flour, but wow, flavor makes up for It! Will be making these again! Thanks for sharing! Hi! I would love to try these but am so new to baking. Just a couple of questions first, coconut oil?! Is is the same oil I would use if I was cooking? Also, are there any substitutions for honey?! Thank you so much! Hi Nicole, Coconut oil can be used for cooking, but is not the same as a vegetable or canola oil. It will be labeled “coconut oil”. There isn’t a good substitute for honey, sorry. Happy Baking! Any replacement for almond flour?? These look DELICIOUS! Thanks for the hit about spreading them out a bit too. Hi Maureen, Without being by your side in the kitchen it is hard for me to figure out what went wrong. The most likely culprits are 1) the cookie dough was too close together on the pan, 2) it didn’t rest long enough, 3) the cookies all had too much cookie dough. These cookies are a thin, crisp, and chewy cookie and when I tested them more recently they spread a lot more than when I originally made them. My best guess that is because of different coconut flours having different absorption rates. These are in the oven and the recipe certainly didn’t make 18 cookies. And I used less dough than suggested per cookie. And the instructions don’t indicated how long in the oven? I was thinking not very long since they are very tiny cookies. Thanks for taking the time to leave a comment. I recently updated this recipe and it made 18 cookies for me when I used 1 1/2 teaspoons of cookie dough per cookie. Step #7 in the instructions says to bake the cookies for 10-12 minutes, sorry you missed it. They won’t be fully set, but will lose their wet “shine”. Hope that helps, and that you enjoyed your cookies.